Whether you’re an existing volunteer or completely new to NightShift, our weekend FORGE course provides a good foundation for anyone to get involved in street outreach at NightShift, or elsewhere. Our next FORGE session is now taking place on a Friday evening and all day Saturday in June 2019: book your space now! From time to time we offer group training, including programs for youth groups (age 13-18). More information for groups is available here. FORGE helps you to serve and lead well and provides you with reliable tools for your belt. The material will help you to understand street life and poverty and will build on those skills with communication, compassion and teamwork. You will meet police officers, addictions and mental illness specialists, counsellors and more. These caring professionals will teach from their areas of expertise, providing you the most up-to-date, applicable information possible. There will be classroom interaction, role-playing, group discussions, personal analysis and hands-on training. As a bonus, the program provides life-skills training that can be applied in any area of your life. Our job is not done. There is a growing number of people in need all over our cities. It’s going to take an army of passionate, equipped people to reach them. It’s our job to empower you with the teaching and training you need to serve and make a difference. Introduction to NightShift and our mission, values and vision; understanding poverty and homelessness. Guest speakers provide an introduction to mental illness and addiction. Guest speakers deliver insight into compassionate and constructive communication and how to deal with the overdose crisis. Guest speakers give an introduction to human trafficking, trauma and conflict. First Aid demonstration and volunteer support presented by guest speakers. Understanding the NightShift approach, policies and procedures; graduation. It’s not much! There is an educational fee per adult of $60 (or $100 per couple) to help cover the cost of materials, including a participant’s guide, a copy of The Shift book, NightShift gear, a graduation certificate and more. 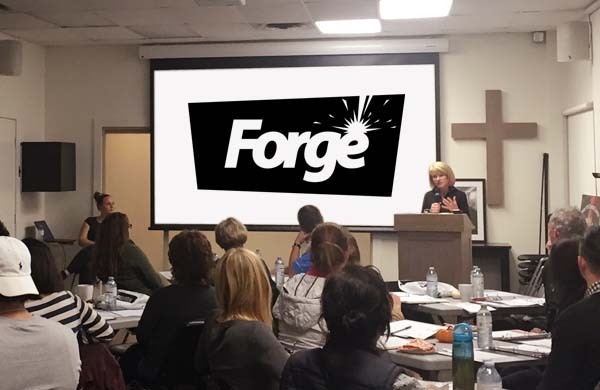 Register online for FORGE June 2019 now or email us with any questions.